Want to charge your car wirelessly? Or invest in a next-gen VR headset? Or see what BlackBerry has planned for its next smartphone? We've got all those stories and more besides in our regular roundup of tech news, courtesy of our friends at TechRadar. 1. Could the Lenovo Z5 be the first truly bezel-free phone? Bezels have been rapidly vanishing from smartphones for a couple of years now, but no one has quite managed to erase them completely. 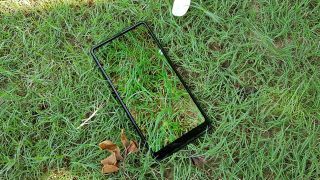 Enter Lenovo, which is teasing a phone called the Z5 that is just about all screen on the front – according to Lenovo Vice President Chang Cheng, the handset boasts a 95% screen-to-body ratio (topping the Galaxy S9's 83.6%). When will we see it though? Lenovo isn't saying, so maybe not for a while yet. You might already be used to charging up your smartphone by dropping it on top of a pad, but now BMW has firm plans to bring the same tech to your car – at least according to reports today. The motor manufacturer has said it's going to introduce an inductive charging pad in July, which will be the first time we've seen it in the consumer market after years of promises (in fact this pad was originally announced back in September). Before manufacturers can bring out headsets, component makers need to upgrade the gear that goes inside the likes of the Oculus Rift and the HTC Vive, and Japan Display (JDI) just announced a new screen that more than doubles the pixel quality of the current generation of devices. The 3.25-inch display comes with 1,001 pixels-per-inch (ppi), all set to play a part in whatever the likes of Oculus, HTC, Sony and others are planning next. BlackBerry just announced a new phone launch happening on 7 June, and the handset we're going to see is called the Key2. Based on earlier rumours, the Key2 is going to come with the classic BlackBerry physical keyboard, but based on the "an icon reborn" tagline featured on the invite, we suspect there will be plenty of nods to the modern smartphone era too. In less than a month we'll get a proper look at what BlackBerry has been making.